It is important to know where Mercury was positioned on your natal chart when you were born. This planet says about the way we think, speak and use our communication in general. 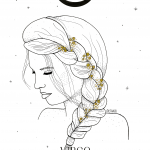 Let’s know more about Mercury in Virgo? Earth is the element of Virgo (just as Taurus and Capricorn) and Mercury is its very ruling planet. In Astrology, when this combination happens, we say the planet or star is “in domicile”. So we can say Mercury is comfortable and feeling at home in this positioning. Speed is the main feature of Mercury, but unlike Mercury in Gemini that has the element air (Gemini also has Mercury as regent planet), Mercury in Virgo applies that speed more deeply. They will have the same almost instantaneous ability to reason, but will have an exaggerated tendency to detail. If Mercury in Gemini had a great risk of getting burned out with its own mind, Mercury in Virgo runs that risk double. Because in addition to thinking a million things at the same time, they will be lost going to the end of the line of their thoughts. They are very intelligent beings and if they apply this intelligence to perceive what deserves attention and what does not, they will have a lighter and easier life. Not everything needs to be thought of in the smallest details. The brain of those who have Mercury in Virgo really works like a computer. They receive information and immediately scan it. They process for some time and give you a full report. The ability to analyze and unravel information in multiple parts and layers can be a Herculean service to others, but not to them. Their very logical and analytical reasoning form professionals who have a taste for methodical and millimetric activities. As they are also very applied, they would be great scientists and researchers. Outstanding intelligence and rapidity of learning make it easy to learn and even teach other languages. Their trained eye to find (and avoid) mistakes will make them excellent copywriters as well. Errors in vocabulary or grammar? This does not exist in the life of a Mercury in Virgo. They like to follow a routine and have no problem staying on big projects. On the contrary, they even prefer it. However, the ease of maintaining focus can easily be confused with that side that Mercury in Virgo has to be able to get rid of. As they are extremely perfectionists, they will always seek and find fault with everything. This prevents them from moving forward and finalizing their goals. You may have realized that these people can suffer from process paranoia, right? They are very organized and like things like that in every living environment. They may develop obsessive compulsive disorder and it is good to pay attention to their habits to not get to that point. It will be those annoying parents who complain if they see something out of place in the house. This facet of them can be extremely tiring to others. Because seeing someone who can not relax for a minute puts anxiety on others as well. The key to whoever has Mercury in Virgo is to remember that every computer needs to be turned off once in a while, in order not to burn out.